Definition at line 57 of file detect-threshold.h. 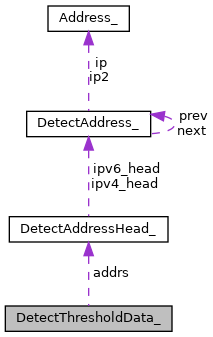 Definition at line 65 of file detect-threshold.h. Referenced by DetectThresholdRegister(), SCThresholdConfInitContext(), and ThresholdIPPairTimeoutCheck(). Definition at line 58 of file detect-threshold.h. Referenced by DetectDetectionFilterRegister(), DetectThresholdRegister(), SCThresholdConfInitContext(), SCThresholdConfParseFile(), and ThresholdIPPairTimeoutCheck(). Definition at line 64 of file detect-threshold.h. Definition at line 62 of file detect-threshold.h. Definition at line 59 of file detect-threshold.h. Definition at line 63 of file detect-threshold.h. Definition at line 61 of file detect-threshold.h. Referenced by DetectDetectionFilterRegister(), DetectThresholdRegister(), PacketAlertThreshold(), SCThresholdConfInitContext(), SCThresholdConfParseFile(), and ThresholdIPPairTimeoutCheck(). Definition at line 60 of file detect-threshold.h.